I like you havent shared my blog with family or in facebook world. I guess if it ended up there I would be ok with it because I do post pictures and things about my family but for now having a little slice of freedom to post whatever I am thinking with out them reading it is pretty cool! It’s nice to have a place to write want I want without worrying about if someone knows me is reading. My mom was not active in social media when I was growing up so I have no idea how I would feel about someone else writing about me. 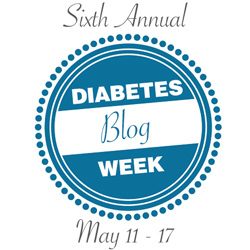 I’ve been on the internet talking about diabetes since I was 15 so I know I’m comfortable talking about myself, but having someone else do it would be strange…. I can definitely see how it would be a conundrum!